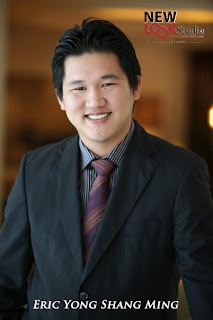 Yes, my name is Eric Yong and I am the face behind ericyong77.com. I'll still be blogging at the other blogs every now and then, but then for the time being, lets focus all attention over here. Lets have a little recap. My name is Eric Yong. For starters, just in case you were wondering how the 77 in ericyong77 came about - thats actually my favourite number; as well as my number plate. It is NOT, I repeat, it is NOT my year of birth. I am seriously not so old. I graduated from City University, London back in 2003. I joined my dad's company 2 weeks upon coming back. I read a lot of different blogs online - those that talks about cars, girls, events, or just pure ramblings. I was reading online of some of the top CEOs in all these American firms and groups having their very own CEO blogs. I mean, they rated Jonathan Schwartz's of Sun Microsystems, Adobe's Kevin Lynch and even Dallas Mavericks' Mark Cuban's blogs amongst the top 10 in the world of CEO blogs. These guys can really write! - they provide an insider of their personal thoughts, their targets and objectives for their companies, and an industry outlook just to mention a bit. I am actually very young. I went to a top notch private school in PJ. While other people were skipping classes, I skipped an entire year. Yes, I jumped a year, didnt have to do Junior One. Haha LOL. Being underaged was not fun - I didnt get to do my UPSR you know. I did the South Australian Matriculation back in 2000, but detoured to UK instead the following year. All in, I graduated just before I turned 20. I prefer to tell people that I graduated at the age of 19. Hahaha. I know the picture on the top right seems a little corny, but I dont have many pictures though. That was taken in 2009 when I was on the Prestige's Top 40 Under 40. I then searched around for a construction-based or say, building industry insider blog. But I couldnt find any. Thats how I got inspired to start my corporate blog - the one on construction and property development. That is also my personal official blog. I am currently an Executive Director at Crest Builder Holdings Berhad - a Main Board listed construction company on the Bursa Malaysia. This website here - ericyong77.com is somewhat a lot more different, and in fact, it'll be full of interesting features of my favourite things, such as super fast cars, pretty hot chics, events, a bit on sports, my beloved Miniature Schnauzers and a lot more random ramblings. I shall try to blog a bit on politics too, and perhaps a lot on jokes and so on. Do come back and read up more often as I shall pretty much update on a regular basis.